How about a MasterRoom spring reverb clone? Accutronics graciously sent me springs and transducer assemblies to modify for the MicMix timings some time ago. After I dropped development on this in 2007 I received a number of e-mails asking "what happened?" I think I got bored counting spring turns and went crazy. The following is from my scrapbook capture of work done elsewhere. The MasterRoom spring mechanics were pretty simple - aluminum L channels screwed together forming a square cross section ran the length of the springs and held 4 Accutronics transducers at each end. The springs ran the length and were connected mechanically in series forming two pairs (x4) on each side. I think the drive transducers were paralleled and the receivers series-connected. The whole gizmo had spacers with bumpers on them to keep the spring assembly from hitting the sewer pipe. It was suspended by springs. What might come in handy is, if I don't have the math right, a pulse response of the tanks. A soundfile of TDR pulse response might prove useful. What you do is pulse, say 1 KHz single-cycle click the tank. That's T0. You will get (in a stereo MR) first-order echos at T1, T2, T3, T4...T8. Those are the ones that really matter. 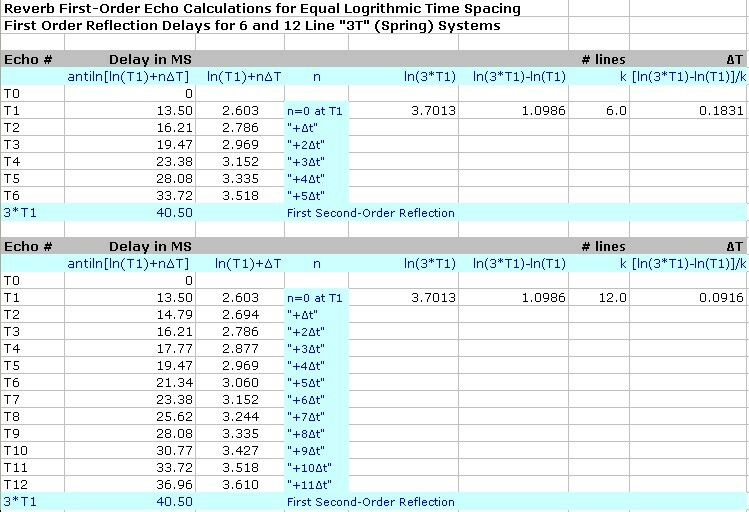 The second-order echos are at 3T1, 3T2, 3T3, 3T4...3T8. Why 3T? Because the second order echos have to reflect off of the receiver transducer at T1, go the length of the spring and reflect off the driving transducer (at T2 which is silent), and then return again through the spring a third time before being "heard" by the receiver at T3. Recursive delay lines are 2T systems and we had to re-write the patent to cover that. For the delay line timings (spring cuttings) I dug up the old log time-domain reverb formulas from mine and Bill Hall's original notes. These calculations are for a 6 or 12 spring system with an initial delay of 13.5 mS. The timings are equally spaced in the log domain. 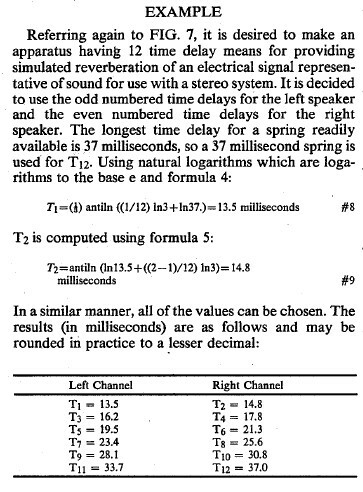 These calculations are in base e. For a six line/channel stereo reverb, the odd timings are assigned to the left channel, the even to the right. When mono'd they interleave. I took the longest spring which equals the last line in the spreadsheet and worked backwards cutting the first spring at ~13.5 ms. Notice the difference in tension between the longest and shortest springs. Accutronics supplied the whole sled for this project. They can be bolted together and suspended by springs or O rings. They sell them online - the last time I checked they had an eBay storefront. For twelve lines (springs) there would be four sleds since they have a three line unit. I was thinking the spring assembly could be separate (remote) with the power amp and preamp mounted with it. Then it would just be line level to and from. I've had an ancient piece in mind to couple with a spring reverb, which I spotted in an early '50's magazine. Circuit is a proper variable vibrato for organ or instrument use, and it cries out to be done in stereo, with stereo spring reverb path. Done with octal tubes, of course. Was that the work of someone at Hammond? It's a cool concept and would aid diffusion in reverbs with a small number of lines. I think I may have seen a patent similar to that once. Have to dig it out. It wasn't associated with any manufacturer I don't think. Very nice article I need to scan and post. These calculations are for a 6 or 12 spring system with an initial delay of 13.5 mS. I remember now that when I first checked the springs Accutronics sent me the "longest" spring (Accutronics longest) was ~37 ms. That's the last entry in the table. 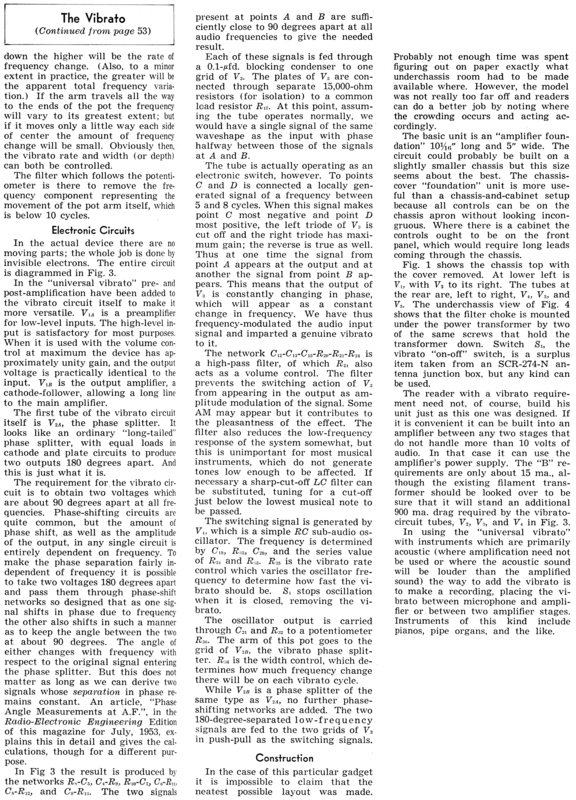 The 13.5 ms figure, dating back to Hall's work, was devised by working backwards from Hammond's 37 ms. In the MasterRoom MR-II, MR-III and MR-IV the springs were series-connected and much longer. I should probably go back and check the math in my tables. I started at 13.5 and worked forward but they should be close. 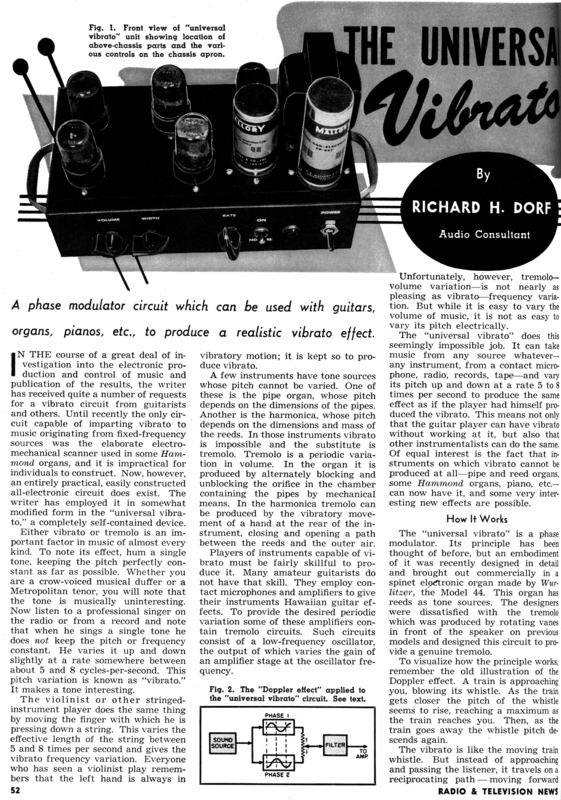 At Roger's request, the vibrato article. Radio & Television News, April 1954. Reads to be a Wurlitzer circuit, or variation. When you have the springs cut to length, how do you attach them back to the transducers? Considering the shorter springs, wouldn't it be sensible to move one of the transducers to ensure consistent traction? If we came to a nicely working final solution, would Accutronics be interested in making a custom-made set? To answer some other questions, the version I had made in the 80's had the springs in a separate wooden box, with two 5metre cables on 4 and 5pin XLR's. Drive was current-driven with floating connections (5 pin) and return was unbalanced (4 pin). I had a capacitor across the return which, in combination with the cable capacitance, induced a pleasant high-mid boost. Recovery was with 5534's for lowest noise. If we use the 12 spring configuration, we'll have to choose the right impedance in order to have the highest possible level combined with lowest noise and interference protection. But in fact, today, I would use some kind of phantom powering and have the recovery amps built in, which would give the possibility to move the external box much futher away. As I mentioned, I used genuine current drive, with a generous 10watt amp (TL071 + TIP29/30), and I must say it suffered the same problem as all standard spring reverbs: boooing sound when driven by percussive sounds. It was very good on vocals and violin, but useless on drums, piano, acoustic guitar. I've always wondered if the current-drive, which by essence has no damping effect on the transducer might be at cause. I think, before entertaining any other research that's the first thing I would evaluate: compare beteween current-drive and pre-emphasized voltage drive. AKG, on their BX series, had a secondary feedback winding on their transducers, which was used to servo the movement on the driver. 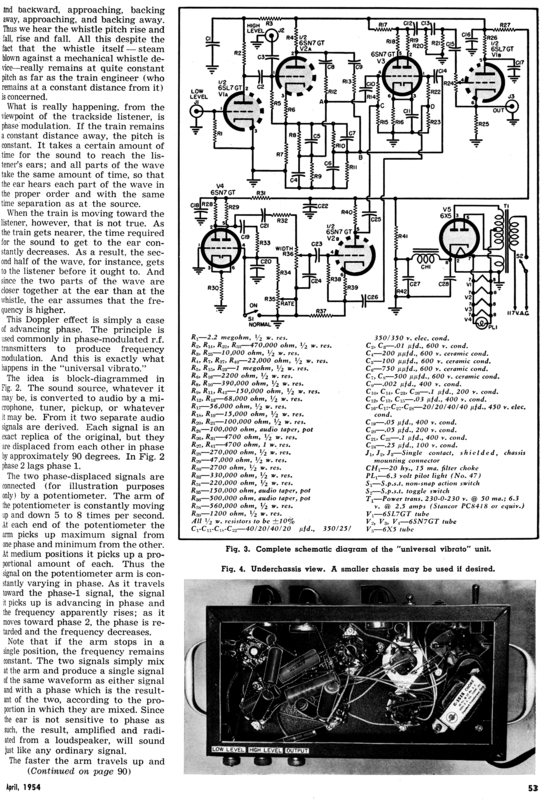 Since it depends on construction tolerances, it was adjustable, and like any servo system, when pushed over the proper operation area would start to oscillate, ending with the premature death of the coil. But I think they found it was necessary to tame the boooing sound. Thanks jlm for your post. You have to re-form the hook which is fairly easy. The women at MicMix who did this affectionately refered to themselves as "hookers" since that's what they did for a day or so at a time. There are three lines per transducer set. After the first two or so the tension isn't as tight. The tension however doesn't effect the delay of the line, the number of turns does since it's torsional. In that sense it's not like a musical instrument string. On the longer lines of the MRIII and MRIV I do remember them placing a small foam plug near the middle of the spring. I don't believe it affected dampening much. They said they would since they can program the spring forming machine to provide a custom number of turns. Once the turns are counted however the DIYer could simply (I think) cut them to length. the version I had made in the 80's had the springs in a separate wooden box, with two 5metre cables on 4 and 5pin XLR's. Drive was current-driven with floating connections (5 pin) and return was unbalanced (4 pin). I had a capacitor across the return which, in combination with the cable capacitance, induced a pleasant high-mid boost. Recovery was with 5534's for lowest noise. If we use the 12 spring configuration, we'll have to choose the right impedance in order to have the highest possible level combined with lowest noise and interference protection. But in fact, today, I would use some kind of phantom powering and have the recovery amps built in, which would give the possibility to move the external box much futher away. The above is almost exactly like MicMix's approach to the Studio B and Studio C series MasterRooms using external spring subsystems. Constant current drive (floating) was used in every model since the inductance of the transducers is very high. This assured constant drive current vs. frequency. Low impedance drivers (8 ohm) were used to obtain higher current with lower supply voltages. In the XL-305 I designed the electronics and springs were all in a single rack mount unit since that was the target market. We used a NE5532 for recovery and an ESM532 power amp. Today I would probably use an op amp plus discretes or a TDA-series audio power amp. The 12 line unit is really 6 per channel with the timings interleaved. The receiving transducers, IIRC, are 2 K ohm which provide fairly good output level. I think they were series-connected to increase the overall voltage. I think in this one I would want to place the drive amp and recovery amp in the spring box but use locally supplied power to avoid phantom power. It could just have two XLRs for input, two for output and a power cord. Shielding of the power transformer will be required and I would probably use a toroid. I'm not sure our DIY unit would need much of a front panel other than an overload meter and perhaps input level. The EQ of the XL-305 could just be done outboard. I might put a Pico Compressor into the drive to act as a limiter. A THAT4301 could also be used on the return to compress/expand the return and therefore alter the decay time. Bob Rodgers and I at MicMix did a lot of work in that area. I must say it suffered the same problem as all standard spring reverbs: boooing sound when driven by percussive sounds. It was very good on vocals and violin, but useless on drums, piano, acoustic guitar. I've always wondered if the current-drive, which by essence has no damping effect on the transducer might be at cause. "Boing" (however it's spelled) is more of a function of the timing of the springs. The secret is in the math. MicMix reverbs were very useful on percussion due to the diffusion provided by "equally-tempered" logarithmic spacing. We used to sell (and use at trade shows) a click pulser to demo it's suitability to percussion. A rim-shot in a MasterRoom sounds very room-like. That was the fundamental difference between it and other spring reverbs and the basis for the patent. The echo density is spread out evenly over time versus the clustered echos of most spring units. If someone is looking for that fluttery reverb sound of reggae the MasterRoom is not the best choice. Fundamentally constant current drive or pre-emphasised drive are going to provide the same thing. Having done both I know that both can sound bad when conventional spring cuttings are used. AKG did a lot of other tricks too including chemical etching of the springs. In a shootout between the MicMIx reverbs and BX-10s and BX-20s we'd always win.